Welcome to “Wheat Free Wednesday”! Raised on “normal” flour, I’ve had a hard time adjusting to the taste and texture of gluten free flour blends. I am also not a fan of the cost of gluten free flours. So I am on a mission to find recipes that use “normal” wheat free ingredients that most people would have in their pantry anyway. Wheat Free Wednesday’s will be days I am sharing some of our favorite recipes. Today, I’d like to share with you our favorite brownie recipe. 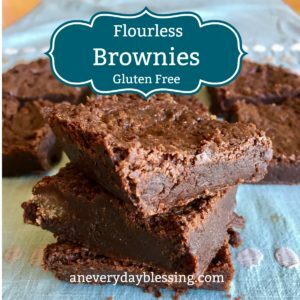 Whether you are are gluten free or not, you will love these. We love serving these brownies hot with ice cream or apple crisp. This post contains affiliate links. Using these links means I may earn a percentage of the purchase at no extra cost to you. St. Patty’s Day is just a month away! 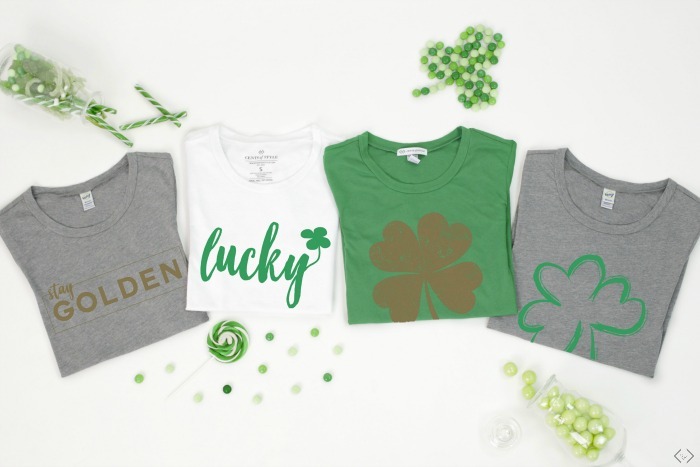 Hop on over to Cents of Style and get a super cute t-shirt for just $17 (+free shipping) with code STPATTY. 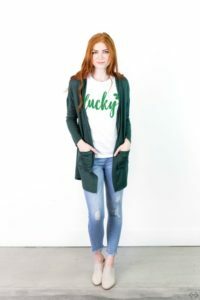 Hurry on over to Cents of Style! 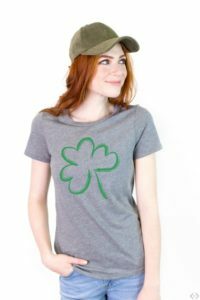 the STPATTY code expires on 2/18. This post may contain affiliate links as a means to support this blog. You may view my disclosure policy here. Meal time is such an important time of the day. It’s a place for the family to gather, a time for the family to connect. I want the table to be a place where my kids feel like they can share about their day, no matter what may have happened. 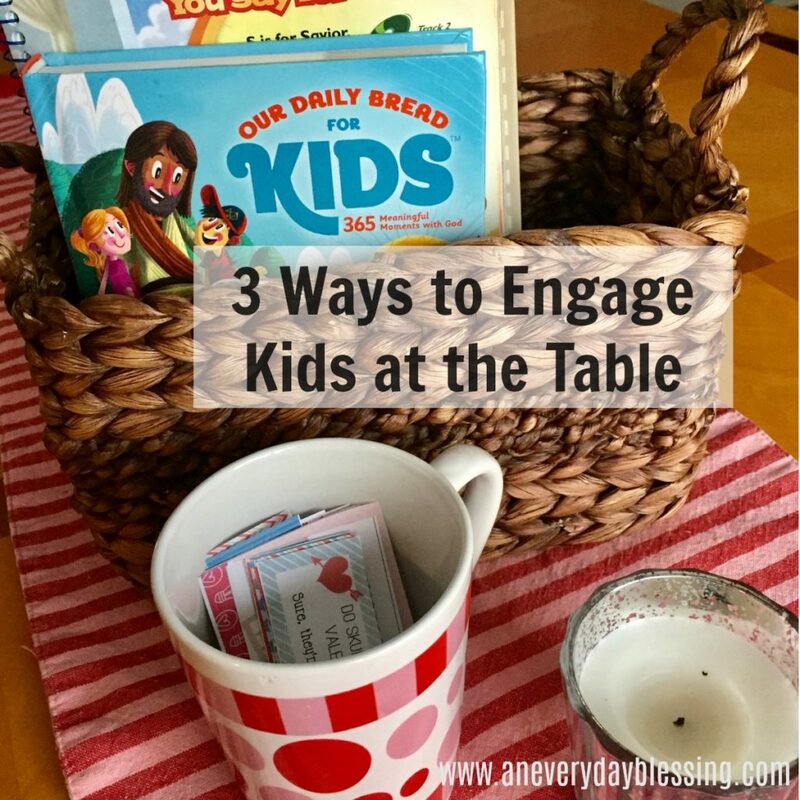 There are three ways we have began to engage conversation at our table. Motherhood is not easy. It is physically, mentally and emotionally exhausting, no matter what age your kids may be. As we try to meet the needs of others around us, we often neglect taking the time we need for ourselves. Yet while I was writing this post, “The Law of Diminishing Return” kept coming to mind. At some point, a mom’s productivity level and quality will greatly decrease if she does not get time to re-charge. Dear fellow Mom, it is okay to take time for yourself. 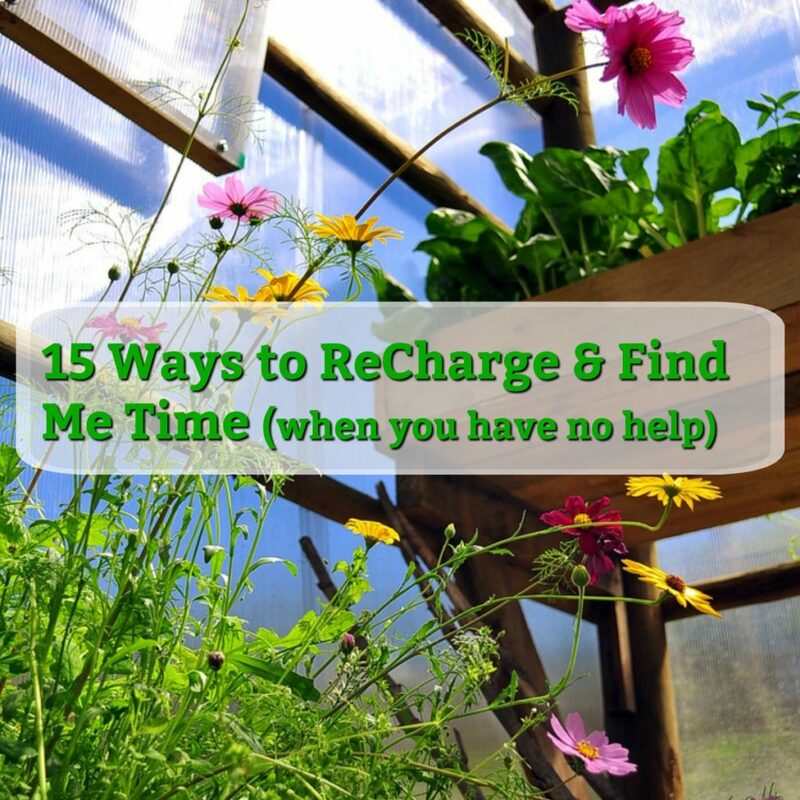 Even if it is just 10 minutes in the middle of your day, you need it to re-charge. But how? In the midst of balancing the crazy schedules that come with motherhood, how do we re-charge? How do we find “Me Time”? What even is this thing called “Me Time”!?! Well, I took the question to Facebook and let fellow moms in the trenches answer the question! 1. Choose a night to purpose to not “keep working” after kids are put to bed. Lay aside all the household tasks that still need to be complete. Instead, take time to read the Bible or a book, watch a movie, or even go to bed early. Wake up early. Utilize naptime. Study after kids go to bed. 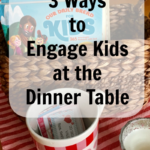 You may even read aloud to your kids at a mealtime. 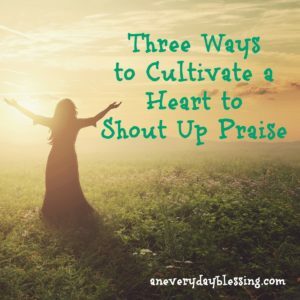 Jani Ortland, author and speaker, shared on a Revive Our Hearts broadcast that when her kids were little, she and a friend would take turns watching the kids for 2 hours. The “free” mom would strictly use this time to dig in depth into God’s Word. Yes, she still had quiet time every day. But every other week, she knew that she would have 2 hours to dig deeper and be revitalized. Use Sunday School and Service Times as “Me Time” to get rooted and challenged in God’s Word. Over and over again in my Facebook poll, mom’s would say, “Go to a Ladies Bible Study at your church”, “Join Bible Study Fellowship”, “Find a mom’s group like MOPs”. I have to admit thinking, “These ladies must all be extroverts!” But even being an introvert, I love being part of a ladies Bible study, getting encouraged and challenged in God’s Word. Our “MomStrong” group is one of my favorite activities each month. Often, a Ladies Bible Study, BSF or Mom’s group will have free to low cost childcare. You will have some time enjoying adult conversation knowing your kids will be well cared for. 5. Wisely prioritize your time to what is truly important to you. We waste so much time on things that don’t matter. How much time is spent on social media, surfing the internet, browsing Pinterest? Put your phone away! Leave it somewhere in your house where it is not easy to access. Instead, focus on the tasks at hand so that you can have time later on for yourself. Also, be organized. So much time can be wasted looking for things. My mom always said, “There’s a place for everything, and everything in its place.” I too now say that to my family. Have a “home” for everything in your house. Make sure items get put back into their place. Take time before the kids wake up or after they go to bed. Put a show on, or let them play “ABC Mouse” in the middle of the day so that you can do a little workout. If needed, put the kids in a stroller and go for a walk. Join a gym that has childcare. One mom says, “The YMCA is a lifesaver for me…I get to workout and my little one has fun playing with the other kiddos.” The YMCA even has a Parent’s Night Out. Get up an hour before the kids. Take a long shower, enjoy a cup of coffee alone, spend time in the Word. Throw kids in the stroller and go out for a walk. 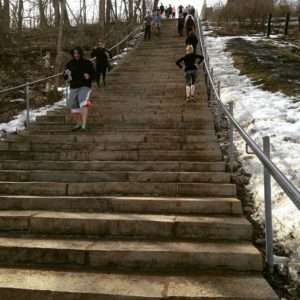 Take the kids to the park or to a place to hike. Sometimes a change of scenery is what both you and the kids need. Find a group of God-living, Kingdom-seeking mommas to share life with. Maybe there is a mom you can trade days with once or twice a month so that you can run errands by yourself, or just sit somewhere to read or dig deep into Bible Study. If possible, find a reliable babysitter so that you can go and do something for you! It’s beneficial to everyone for you to get a break so that you can take care of you. My mom would always tell us, “Kids turn green after 8 o’clock!” And it is so true. My kids could be fun and cheerful all day. Then 8 o’clock comes, and they change for the worse. In my home, I try to have my kids in bed by 7 or 7:30. There are a couple evenings that we have later nights, due to church or activities we have scheduled. It makes such a difference though when they can be in bed early. I realize that this gets a little more challenging as children get older, or if they are in school. Set a reasonable bedtime for your family and stick to it! You need time for yourself to unwind. Use nap or rest time to let yourself re-group and breathe. Non-napping children may listen to an audiobook, read, do puzzles, or play quietly. Let them know that interruptions are only allowed for emergencies (otherwise quiet time will be extended). During this time, have a cup of coffee or tea, take time to read God’s Word and pray. It’s okay to do absolutely nothing during naptime. Sometimes you need time to re-charge yourself, so the rest of the day can be productive. Re-think what you call “Me Time”. Think of it as getting something completed that will add value to your life and will reduce your stress. For example, “Me Time” may be folding and putting away laundry. Or perhaps it is clearing the kitchen sink from dishes. This takes a stressor off your plate, and it’s one less thing to think about later. I remember some time ago, a friend posted on Facebook that she was sitting in her van sipping a Starbucks beverage while her kids watched a movie. As moms, sometimes we have to do whatever works for that moment. Susanna Wesley was a mother of 10 (living) children. You may recognize the names of John and Charles Wesley, two of her sons. If you have time, look up her story. It is fascinating! She had a lot of responsibility. Yet time with the Lord was dear to her. So, in the middle of home-life chaos, she would sit down, flip an apron over her head and pray. Make “Me Time” an appointment that you cannot miss. Write it on your calendar. Make it part of your “to-do list”. Prioritize it. Take time to be refreshed so that you can be the best mom and wife that you can be! Chime in! How do you recharge? Is there something you need to start doing to get time for yourself? Valentine’s Day is just around the corner. 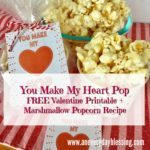 So today I wanted to share with you a sweet little treat and a FREE Valentine Printable. 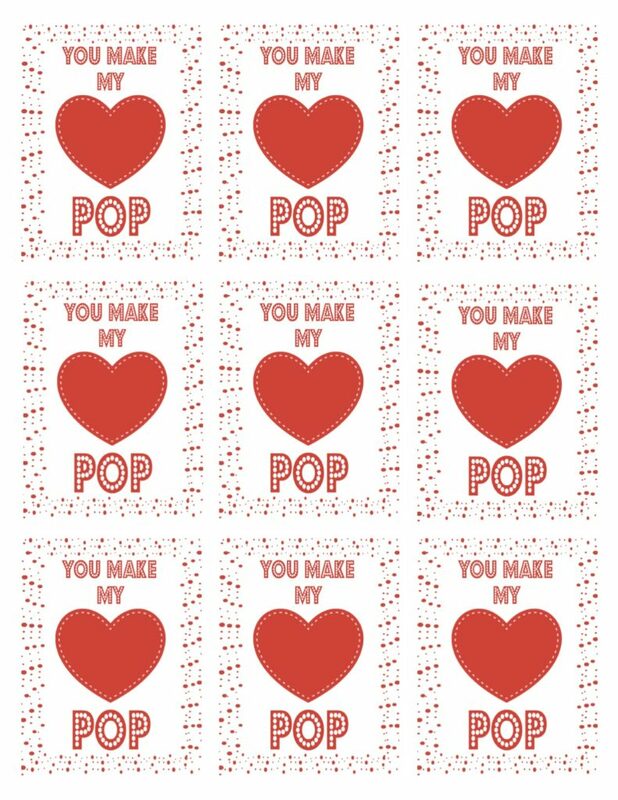 Click the image below to grab the free Valentine! 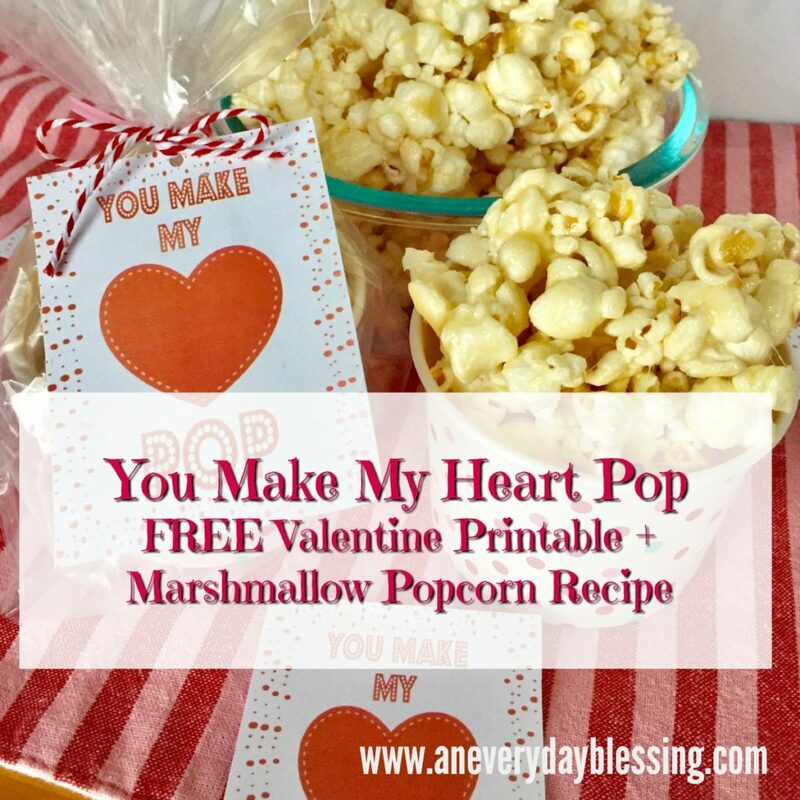 Print it and attach to little bags or cups of Marshmallow Popcorn (recipe below). This Marshmallow Popcorn is super easy and so very yummy. I added a little salt to this recipe, because I like a sweet and salty combination. You won’t be disappointed! I freshly popped our corn in an air popper. If you use microwave popcorn, it may not need the salt. But I wouldn’t know. My family loves our air popper and rarely makes microwave popcorn. 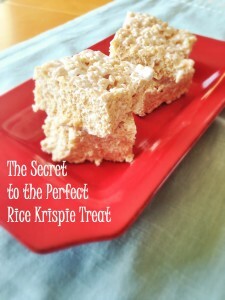 I’m sure you will love this sweet little treat as much as we do. Place butter and brown sugar in a medium size bowl. Microwave for about 1 1/2 to 2 minutes. Add salt and marshmallows to the bowl. Microwave for an additional 1 1/2 to 2 minutes, until marshmallows are melted. Stir well. In a large bowl, pour the marshmallow mixture over the popcorn. Gently stir to coat. Let cool before handling. Are you trying to get organized in this New Year? 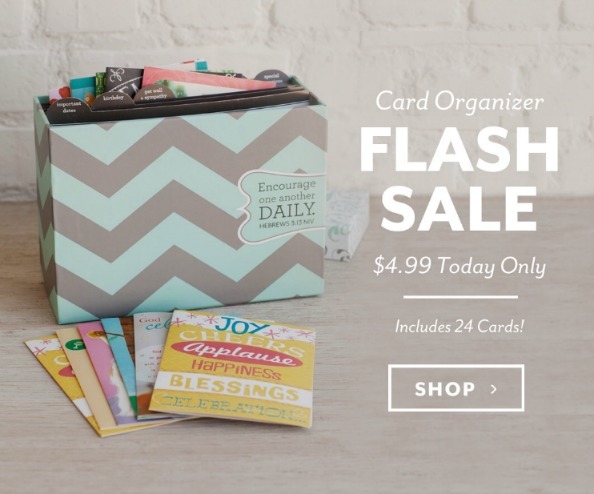 Check out this fantastic card organizer from Dayspring. 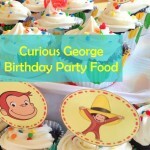 The Organizer includes 24 cards and envelopes along with removable, occasion dividers. It is on sale for today only (1/8) and is only $4.99! So hurry up and don’t miss it!! Journals, Gifts & Thank You Notes- 30% off with code GRATEFUL30 from 1/6-1/13. NOTE: This post contains affiliate links. You may view my disclosure policy here! As the holidays have passed, Christmas clutter has cleared away, and we can finally get back into some sort of routine, I am excited to complete some much needed projects! January usually puts me into a “declutter and get organized” mode, but this year has a deadline with it. 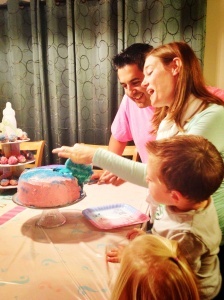 In less than 3 months, our little family will be welcoming baby #2, so time is of the essence. My project list is lengthy! I know there are some things that if I don’t get them done before then, it probably won’t get done at all. Currently the bedroom is pink! 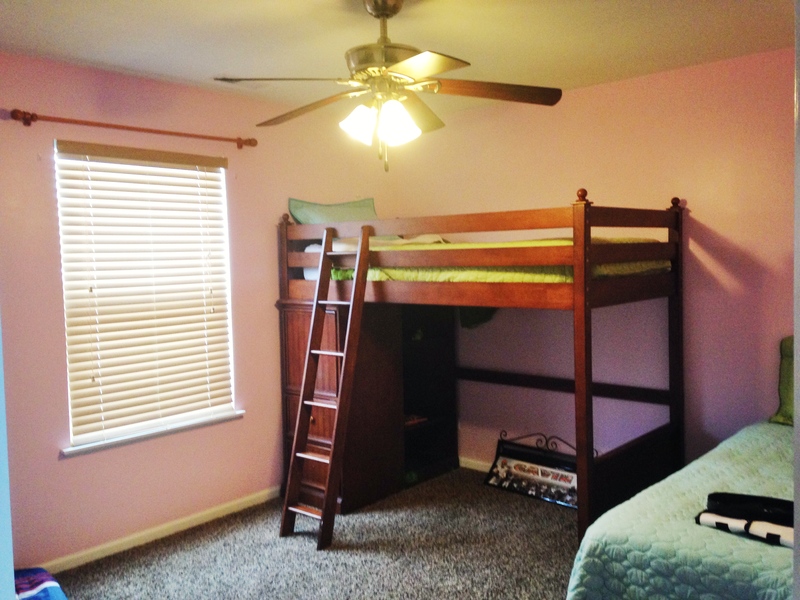 The former owners had two little girls, but we weren’t in a rush to paint this bedroom. The bedroom was only used for out-of-town guests, or when nieces spent the night. And from the start, my nieces claimed this bedroom as theirs! Thankfully, I have a brother who is a painter and is going to come and paint it for me. If it were up to me, it would probably take me the ENTIRE month just to paint the room, while it will take my brother an evening. The closet in this bedroom has become the “dumping place” for items I plan to sell at a garage sale, or simply random items I just haven’t found a home for yet. It’s a mess! I have a pile of clothes I need to tag for the garage sale, and the bin I had to place garage sale items in has been used elsewhere. 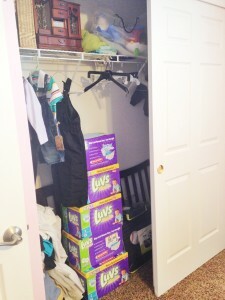 Every time I look at the mess, I just want to close the closet doors and walk away. This should be a fairly simple task, as I just need to set up a couple closet organizers and move clothes from the nursery closet to the “big boy” closet. My challenge is that I don’t really have an available dresser to put my son’s clothes in, so I’m trying to come up with other “organized” ways to keep his clothes. While I would very much like DECORATING to be on this list as well, truth is I’m not fully sure HOW I will be decorating yet We have my son’s bedding, but I haven’t found wall décor that I like yet, and I am waiting for his birthday to ask for a few things that I would like to put in it. His room will be a work-in-progress for sure. Right now I’m just glad my son is excited about his new “big boy” bedding and bedroom. I am embarrassed to admit that my son will be 3 in April and I have yet to complete his Baby Album! I feel like a horrible mother. This year I started his “first year” album, and then realized I was missing a ton of pictures (I am hoping they were not “lost” as we no longer have the computer they were stored on, and many files were lost during the transfer when the computer was getting cleaned out). Over the past month, I have slowly but surely been working on his first year album, and also on 2014. My hope is that by the time the baby comes, I will have the past 3 years of pictures completed in photo albums. Quite simply I hope to just put 15-minutes a day aside to work in the bedroom. This is a manageable amount of time, and if there happens to be a day where I can spend more time in the room, all the better!! As for the photo albums, I hope to work on them little by little when I have time in the evenings. Maybe I can even get a few hours one day to focus on it so I can really make some progress! What about you? 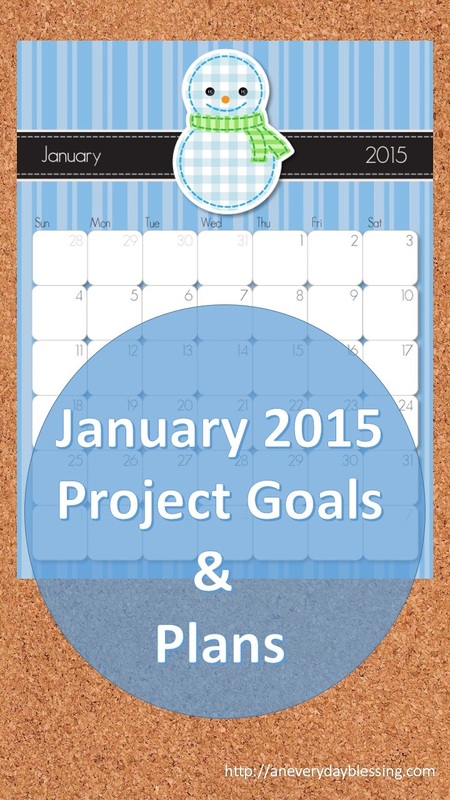 As you settle into this New Year, what projects do you plan to accomplish? I love Pinterest. Anytime I am looking for a “how to” tutorial, I turn to Pinterest. Need a meal idea? No problem! Pinterest boards come to the rescue. Am I looking for a way to keep my two-year old occupied, Pinterest has the answer. So a couple weeks ago when I started planning our Gender Reveal Party for our little miracle baby, Pinterest was the first place I looked to for ideas. Yet in the last couple weeks I have been busy canning apple pie fillings and applesauce, dividing 120 pounds of chicken up between four household with my sister, and attempting to turn some of my 35 pounds of chicken into freezer meals. On top of that I was busy taking care of my husband, who was home from work for a week with painful shingles. Then my son came down with the stomach flu (which lasted 8 days), and in the middle of those 8 days it was inevitable that I too would have the stomach flu for a weekend. Oh, ideas raced through my head. I dreamed of all the super cute ideas I saw on Pinterest. I thought about having a bakery make a super cute cake for us (until I realized I really didn’t want to spend $40+ for something that was just going to get eaten anyway). But reality set in. Two days before the party, my two year old and I were finally able to emerge from our shut-in status to venture out shopping. 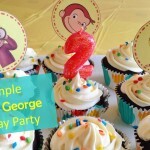 All Pinterest ideas were put aside and I voted for simple. 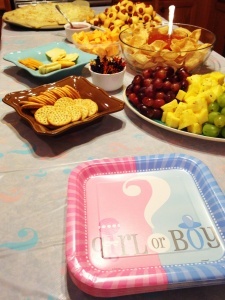 Our only decorations ended up being the “Boy or Girl” table covers, plates and napkins I had found at Walmart, along with a little “Baby” cupcake stand. I admit, I did have some streamers and balloons to hang, but I ran out of time. The night before I knew getting sleep was more important than exhausting myself by staying up too late decorating, and before the party we had a visit with my son’s birth family. It ran a little longer than I planned for, which left my scrambling to finish last minute food preparations. Even our beverages were kept simple: some pop we had left from a previous party, coffee and water. My family drinks mostly water anyway, so why do we feel the need to make sugary beverages for parties anyway? 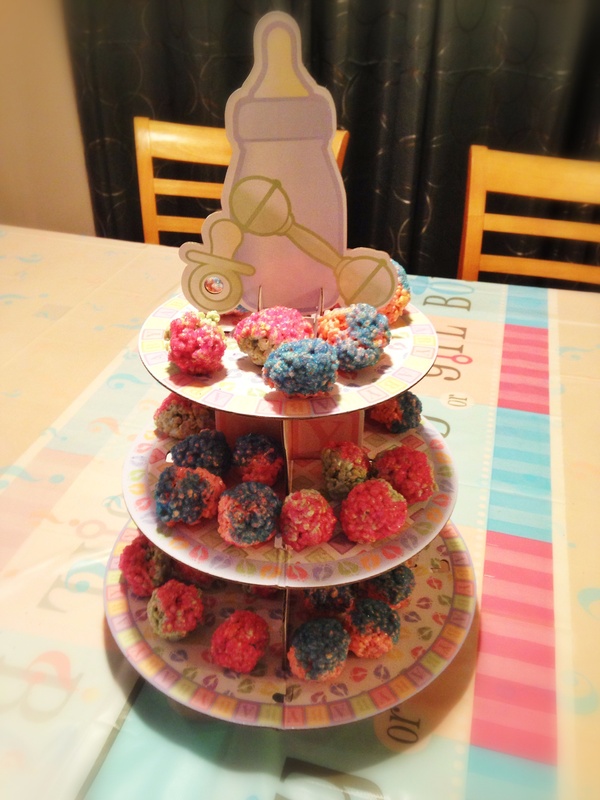 Yes, I did find a lot of cute, amazing ideas on Pinterest, yet I was still so glad I kept it simple. When it was all said and done, the party served it’s purpose: the gender of our miracle baby was revealed, we were able to share the celebration with family, and I didn’t work myself into complete exhaustion trying to do too much. 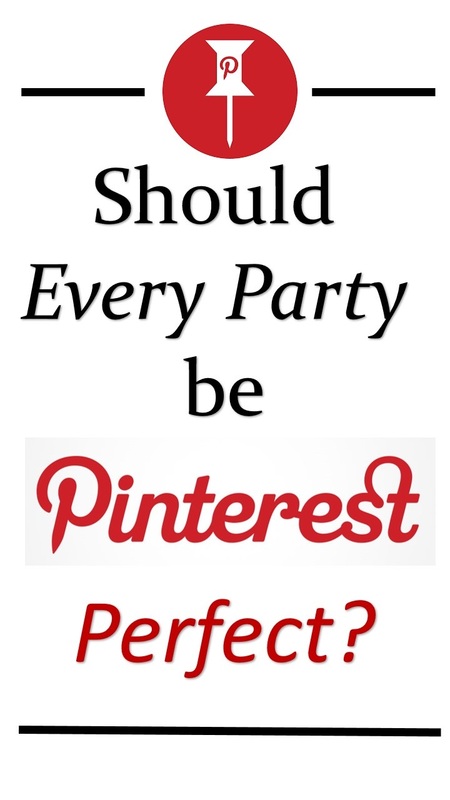 Was the party “Pinterest Perfect”? Not by any standard! However, the party was perfect for us, and that is the most important.